Packed with competitors, friends and family, Antigua Yacht Club was filled beyond capacity as close to a thousand revellers gathered for the RORC Caribbean 600 Prizegiving. Royal Ocean Racing Club CEO, Eddie Warden Owen, opened proceedings and welcomed the Honourable Winston Williams, Minister of Sport for Antigua and Barbuda. 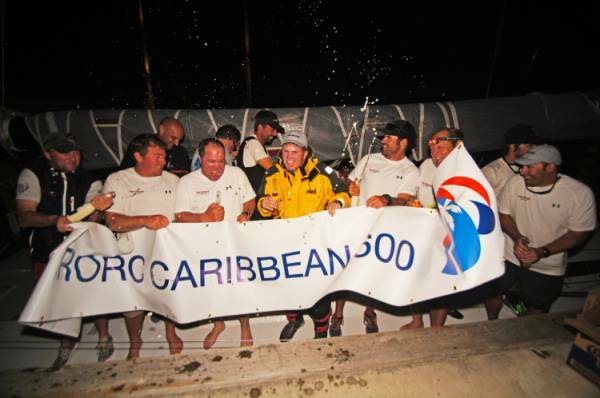 In a rousing speech, the crowd joined the Minister in hailing the 5th RORC Caribbean 600 as a tremendous success. The Minister for Sport was joined by a host of VIP guests including: Eleston Adams and Gerry Daniel representing the Ministry of Tourism, Colin James CEO Tourism Authority. Claude Anthony and Anne Marie Martin from National Parks and the Royal Police Force Deputy Commissioner, Henry Christian. At 0900 on day five, four yachts are still racing after a surge of arrivals last night and early this morning. With all of the class winners now decided, there will be a fantastic atmosphere at tonight's RORC Caribbean 600 Prize Giving, which will start at 1800 at Antigua Yacht Club. In IRC Two, Scarlet Logic was the clear winner. Ross Applebey & Tim Thubron's British Oyster 48 took line honours and the class title for the second year running by over three hours. Dockside at English Harbour, Ross Applebey was quick to praise his co-skipper. "I have complete confidence in Tim and that means a hell of a lot. Basically, one of us was always on deck allowing the other to rest and that trust kept both of us alert for a good period of the race. Many of the crew has sailed with Sailing Logic in the past and they were magnificent. I couldn't have asked more of them" said Ross "Probably the low point in the race was getting stuck for four hours behind Guadeloupe and watching Triple Lindy close a massive gap, but we picked ourselves up and got away well." Asked about the high points in the race? "Well that would have to be trucking along at 17 knots at night with the kite up heading for Nevis. That is the kind of sailing you can dream about all your life." 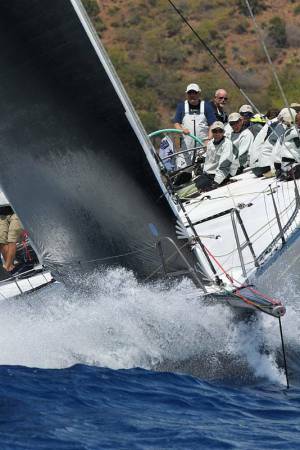 With eight Swan yachts in this year's race, competition was intense for the Swan Caribbean Challenge Trophy which was won in 2012 by Wendy Schmidt, owner of Swan 80 Selene. The prestigious Swan Challenge Trophy goes to the first Swan to finish on corrected time under IRC and will be presented to Anders Nordqvist, owner of Swan 90 Nefertiti. Nefertiti completed the 600 mile course in just two days, seven hours and 57 minutes, finishing 5th in IRC overall on corrected time. 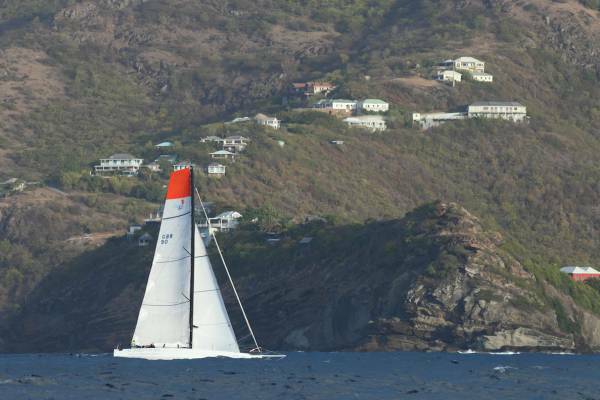 This was the second year Nefertiti has competed in the RORC Caribbean 600 and the Swedish team showed a marked improvement on their 2012 results. At 1300 on Day Four 20 yachts are still racing with the majority of them expected to finish the race later today or in the early hours of tomorrow morning. 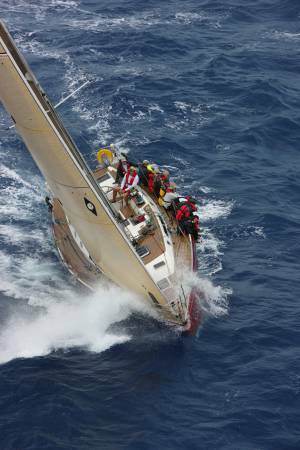 Antigua Yacht Club has been open all hours, providing a safe haven for tired crews. Every boat is met by volunteers eager to greet tired sailors, day and night with warm hearts and cold beer. Over half the fleet is now accounted for, however there are some weary teams still battling it out. The tough conditions over the last three days have abated a little but the big seas remain, making progress difficult for the yachts still racing. Spare a thought for the three Figaro II teams; just four up in a 33ft boat, tired, wet and hungry. 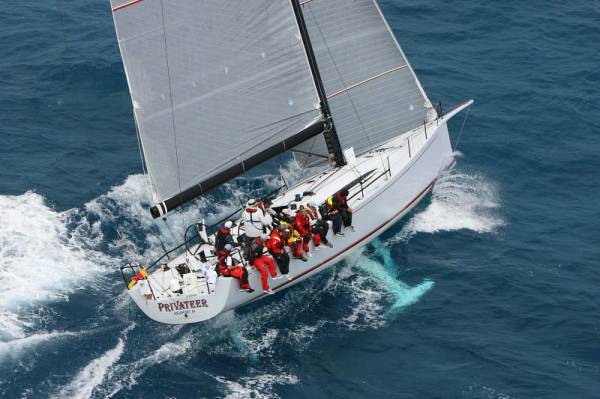 For them above all, the RORC Caribbean 600 is a labour of love. Arthur Prat leads the Figaro Class by a slender 3 miles from Baptiste Maillet. Both yachts are expected to arrive in Antigua early this evening. Just after dusk at 19:34:34 Ron O'Hanley's American Cookson 50, Privateer, came through the finish line off English Harbour, Antigua. The 12 crew were tired and hungry but most of all thirsty for knowledge. The team from Newport, Rhode Island, USA knew it was close...too close to call. 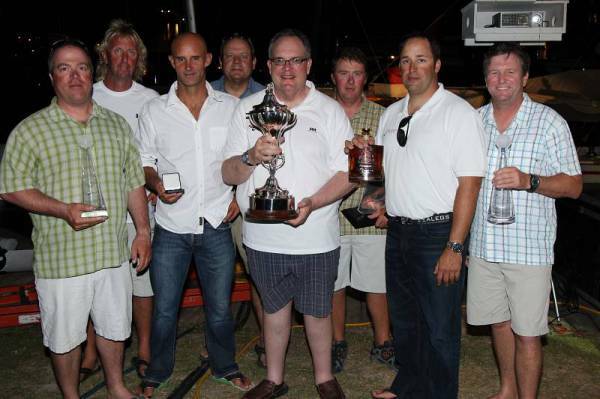 They had sailed their socks off and knew they were in with a chance of winning the coveted RORC Caribbean 600 Trophy. The RORC Race Team gave Ron O'Hanley the good news that his Cookson 50, Privateer, had beaten Hap Fauth's American JV72, Bella Mente, by just over 22 minutes on corrected time to top the leaderboard for IRC Overall. At 0700 this morning only Adrian Lower's vintage Swan 44, Selene, has a mathematical probability of eclipsing Privateer's corrected time, but Selene needs to cover 200 miles in 10 hours, which is highly unlikely. 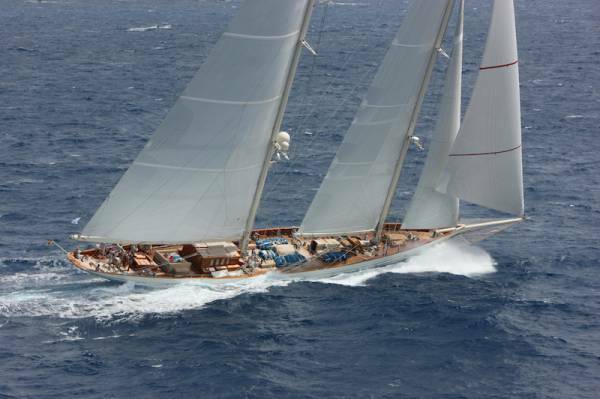 Adela fininshed at 20:12:04 to win the Superyacht and Spirit of Tradition classes. The 183' schooner sailed a great race to finish ahead on the water of their larger rival Athos. Ron O'Hanley's Cookson 50, Privateer, finished at 19:34:34 this evening to take the class win in IRC Canting Keel and the lead in IRC Overall in the RORC Caribbean 600. The crew on board Privateer will be watching the results closely to see if they can hang on to the lead and beat their best result of 3rd overall in 2010. There are now 34 boats left to finish in the race. Mike Slade's crew on ICAP Leopard were enjoying a cold beer in the Antigua Yacht Club today and Leopard's owner, Mike Slade, was really enjoying winding down after a tough race in which ICAP Leopard took Line Honours for the second time: "That was definitely the toughest of the three races I have done, but I absolutely love this race; the course, the weather and the welcome we receive back in Antigua is just the best, anywhere. 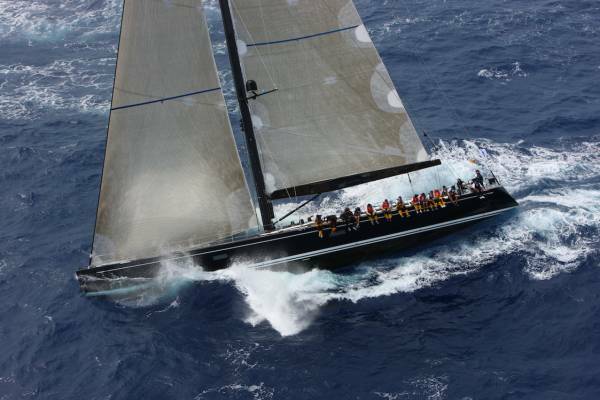 The RORC Caribbean is one of the premier yacht races worldwide and ICAP Leopard will definitely be back next year." 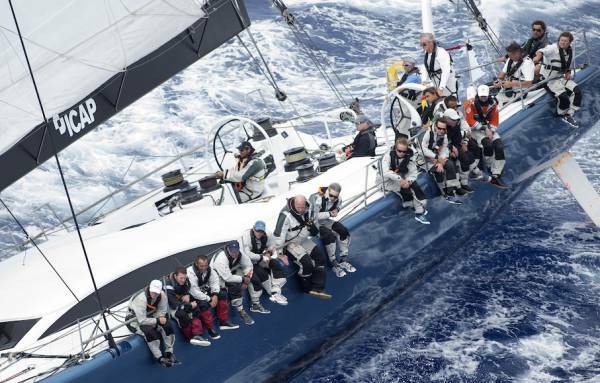 Mike Slade's maxi yacht, ICAP Leopard, crossed the finish line in Antigua to take Monohull Line Honours for the 2013 RORC Caribbean 600 on Wednesday 20 February in an elapsed time of 45 hours 58 minutes and 05 seconds.